colour, then White, or Milld, for it will keepe the longer from rust." I know that helmets in particular were painted, and there are several good threads about it here and here, but I haven't seen a whole lot of evidence of painted breastplates, arms or other components. The reference to Russet and Sanguine are the ones I admit to knowing nothing about. Other than being painted in those colors are there other possible finishes (say browning as you can do with gun barrels) that they could mean? The reference to Russet and Sanguine are the ones I admit to knowing nothing about. Russetting metal could be described as "browning", a form of controlled patination. One method was to rub the metal with animal fat (often sheep fat) to brown it. I don't know what sanguine is, except to say that I'm presuming it to be a similar patination technique as it refers to a ruddy, blood red color. Sanguine: In French, pastel crayon made from red ocre, a reddish orange colour. Also sang is BLOOD in English: So blood colour. The related word " sanguinaire " means " blood thirsty " in English: Sanguinary. From my old LAROUSSE dictionary. Thanks guys, I was assuming the "Russet" color mentioned was a type of browning, but I have never found any references to existing examples of this kind of technique. I was assuming the "Sanguine" finish was a painted red finish, because I have never seen or heard of an example of browning or heat treating that leaves the metal in a reddish color. Anyone who has more metal working experience than I do know anything about getting that kind of color? I have never seen or heard of an example of browning or heat treating that leaves the metal in a reddish color. All kinds of colors can be accomplished with heat and some help from chemicals. There are many different chemical formulas to patinate pieces, to a desired finish. Using a vinegar and oil with heat can produce a reddish brown that would qualify quite well. The Browning that one does to guns is similar and by adjusting the elements one can get quite a range of colors. Once you get into Bronze there are whole books on coloring with patination. I know I have read some recipes from the period for this type of thing but can not remember which reference they were in. The beauty of these finishes is they are basically corrosion that has been arrested at some point. Thus one worries little about it getting scratched or starting up again just dose it with oil. Is there any evidence of heat or chemical bluing/browning/blackening of armor in the late 14th to early 15th centuries England or English controlled France? Or was all armor in that period and location in the white or painted/fabric-covered? If so, how rare was it to have? From my work at the forge all armour that goes in comes out darkened. The real question is what do they do when it is out. Would they leave it blackened? From what we have it is hard to say. People have cleaned much of modern armour (We have a bright 17th century 3/4 suit that was stripped of its blackness). The reason I think much was cleaned off was that the items that do exit still are bright for the most part from 14th and most artwork has it bright looking. Now there are black looking pieces of armour in artwork from the 14th so it could go either way. Excellent! We've done experiments with applying linseed oil to heated helmets and bucklers and they often times come out with a nice gloss black finish, but I've never tried additives to the oil to get a different color. Maybe this weekend I'll be able to try using some vinegar with the oil on a buckler and see what happens. If you get bored (with all the free time you have ) I'd be interested in some of those recipes. We're always looking for demos and things we can show off to the general public. And Nathan, thanks for that beautiful picture! The richness of that color must be absolutely striking in person. My guess would be that as armor developed the white finishes were more of a high status upgrade. More time to finish the armor and more cost in upkeep. Also it would skew the art work of the period to show more white finishes as the art of the period is often not focused on the lower rungs of the society, even to the more median man at arms. Kings and Saints type of thing. As more armor was produced the white finish would become more economical as production and supply filled demand and efficiencies in the market took affect. Also fashion creeps down as well as up so those aping a higher status would go for the polish upgrade. There are many armors in collections today that has colored or worked finishes that are now bright steel. Some conservators in the Victorian era ground them off thinking they were embellishments added later as opposed to what they actually wanted. They were skewed by their own preconception of the knight in shining steel as opposed to a colorful check pattern or interlaced lines of bold color. There is evidence that on the lower end things were left black and even with a hammer finish. munitions grade armor. If it were to be covered with fabric even more so as no one would see the finish. I will try to get my brain to spit out a reference if I can that kind of stuff usually pops out about 4 days after I try to think of it and when I am in the middle of something completely unrelated. If I do I will be sure to send it on. Could I get you to describe this process in a bit more detail, since it sounds like the kind of thing I want to do to my armour. I got a nice fire going with a mix of charcoal (commercially bought) and oak. Once the flames die and we have a good center of coals, I took a grate and set it on top of the coals. I then took a very well cleaned and polished up buckler and applied a thin coat of boiled linseed oil to it. Enough to make it look glossy with oil but not enough to puddle. I then set the buckler (oil side up) on the grate. I didn't time my piece at all but eventually as the metal heated up the oil turned from its normal slightly yellow color to brown, then dark brown and finally black. After it started getting a glossy look to it, I took it off of the fire and gave it a light wipe (using heavy gloves) with a linseed oiled cloth. For the helmets we did the same process except we hung the helmet close to the fire using a cooks tripod and filled the bucket with coals. We found that just placing it over the fire didn't get the peaks of our helmets hot enough. The finish has lasted with a few nicks here and there for the last 3 years. I'll try to get some pictures this weekend. "Filled the bucket"? Do you mean filling the actual helmet with the coals? About how long does this take? Yep, we filled the helmet with coals. All the way up so the whole thing was heated. The buckler took around 15 minutes once the fire was going if I remember correctly, the helmet took a bit longer. A frequent form of decoration on arms and armor is the coloring of certain areas or the entire surface of an object, by means of paint (25.26.1), lacquer (36.25.81), or covering with textiles (29.154.3) secured to the surface by glue, stitching, or rivets (14.100.172). Surfaces and components made from iron or steel could also be patinated, either by heat or chemically, as well as by gilding (see below). Heating metal produces a coloration of the surface, which changes from yellow to purple to deep blue as the heat increases. When taken out of the fire at a particular temperature, the metal retains this color. Considerable skill is required to achieve a consistent and even heat-patination of large areas (e.g., a breastplate) or groups of objects (e.g., a complete armor, 32.130.6). The favored color for armor, edged weapons, and firearm barrels was a deep blue, in a process is referred to as ""bluing."" A range of colors could also be produced chemically, using a variety of different recipes, such as a rich brown color that was popular on firearm barrels in the late eighteenth and nineteenth century. Besides being attractive, patination and painting also inhibit rust on metal surfaces. In Europe, the technique of decorating arms and armor with paint was certainly known in antiquity, although today no surviving objects appear to date from before the thirteenth century. It is more difficult to establish when textile coverings and heat-patination first appeared. Scabbards from swords and daggers are likely to have been covered in fabrics, colored leathers, or fur as early as Egyptian times, if not earlier. The first examples of heat-patination seem to appear during the fifteenth century, but the practice may well be much older. As I recall, Rob Miller of Castle Keep uses an oil bath and heat to brown his basket hilts. The result is what I think of as a reddish brown. 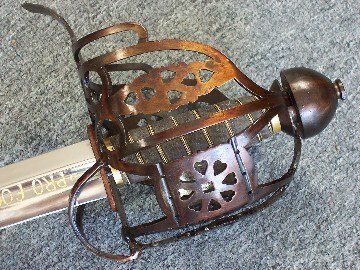 See a photo of my basket hilt, below. I've been horribly remiss in posting my attempts at linseed blackening, so finally here are some pictures of my attempts. Buckler with 3 years of light use. The method used for this one was to paint on some boiled linseed oil with a cloth so there was a thin layer all over the surface. I then put the buckler on a grate over a charcoal fire and heated it until the color was one I liked. Burgonet that has a devotion to St. Michael scratched into the blackening. This one I did the same light coat of boiled linseed oil on but hung the helmet from a camp tripod over a charcoal fire and filled the skull of the helmet with burning coals. The effect was good, but the comb and part of the brim didn't get fully black. Instead they remained a dark brown. You can sort of see the scratched in devotion to St. Michael in the last picture. The last is an old starfire dagger that I had lying around. I stripped it of its wrap and threw the hole thing in an oak and charcoal fire. Once it was "good 'n' hot", I took it out with some tongs and dipped it in a bucket of linseed oil. You can see some bubbles and debris that was stuck to the blade when it was dipped in the oil. In hind sight I'm probably very luck the whole bucket didn't catch on fire. I hope that helps visualize what I was describing. I've never used linseed oil as a quench. I don't know if it would catch fire, but it would definately flame up, which can be a good way to lose a few arm hairs. It is a little different idea, but if a piece is heated and then brushed clean with a brass wire brush, it will leave some of the brass on the piece, creating a gold-ish finish. I've only done this with things I have forged; I don't know if one would have to rough the surface of something like that buckler. Higher heat seems to make this more noticable, but also wears out your wire brush faster. Chris, thanks for posting the blackening recipe. I had a gut feeling that there was something simple, and that was it. Everything else I've seen involves fairly toxic chemicals.